The 5 liter, compact DeVilbiss Oxygen Concentrator is the newest addition to the DeVilbiss family of oxygen concentrators. The DeVilbiss Oxygen Concentrator features an attractive minimalist design that's far less obtrusive in a users home. While the design is new, the 5 Liter DeVilbiss Compact Concentrator incorporates many of the field proven internal components featured in popular DeVilbiss oxygen concentrator models including the 515A or 303 oxygen concentrators. A 5 year warranty is included to facilitate maintenance and repair. 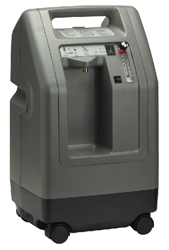 Plus, this new compact DeVilbiss Oxygen Concentrator provides unmatched performance, patient safety and ease of use.